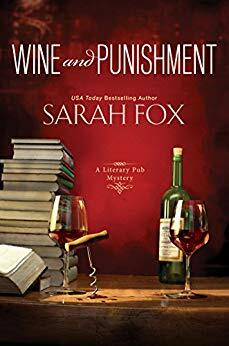 In the first in an engaging new mystery series from USA Today bestselling author Sarah Fox, the owner of a charming literary pub finds her fresh start on the rocks thanks to a case of murder. Booklover Sadie Coleman knows that in life, as in fiction, the right setting can make a world of difference. The small town of Shady Creek, Vermont, seems like the perfect place to start over after losing her Boston job to a merger and her relationship to her ex’s gambling addiction. She’s bought and redecorated the old grist mill pub, transforming the Inkwell into a cozy spot where tourists and regulars alike can enjoy a pint or a literary-themed cocktail, or join one of several book clubs. Little by little, Sadie is adjusting to the rhythms of her new home. Fall in Shady Creek is bookmarked by the much-anticipated Autumn Festival, complete with a pumpkin catapult competition and pie bake-off. Unfortunately, the season also brings an unwelcome visitor—Sadie’s ex, Eric, who’s angling for a second chance . . .
Before Sadie can tell Eric to leave, he’s found dead near the Inkwell. When ..